If you use a bad password more than 5 times within 5 minutes, then you will get blocked by our firewall, so don't try to guess your cPanel password repeatedly. If you have forgotten your cPanel password, or it has been reset by others, then you can easily reset it yourself, via your Krystal Client Area. Start by logging in to your Krystal Client Area. 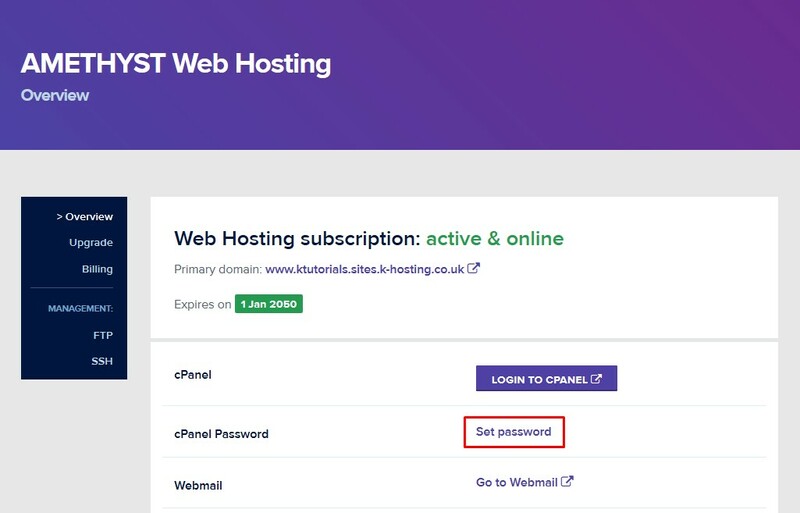 Then click 'Hosting' and click 'Reset Password' on the appropriate account. If you are already in the 'Manage' screen you can also click the 'Set Password' link, which will also pop-up the 'Change password for cPanel' window. If you don't have your welcome email to hand, you can access cPanel via your Krystal Client Area as described above. Once you are in cPanel, your username will be displayed on the right hand side.